Goldeneyes are graceful diving ducks that can stay under water more than one minute. Difficult for a birdwatcher, because just when you see the bird in your binoculars view , it dives down to come back meters away. Fortunately, the Goldeneye is recognisable by a white spot on a dark green head (male) or a grey body with a dark brown head (the female). Mostly they are seen together. 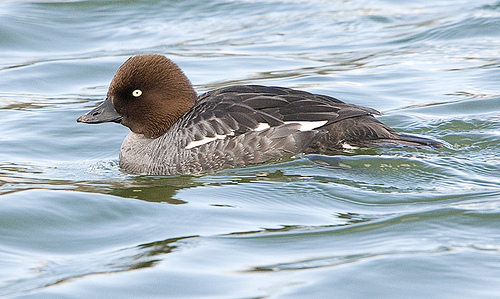 The female Goldeneye is greyish, the female Tufted Duck is brown. 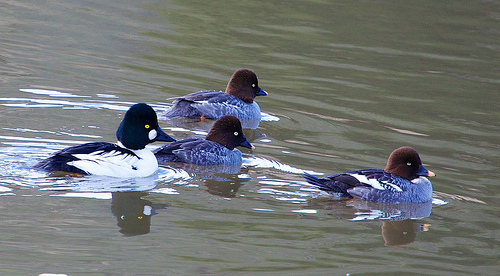 The Goldeneye is smaller than the Greater Scaup and lacks the white spot at the beak.